So, I know I haven’t posted a Martha Stewart Cupcake Club post in a while…. I’ve been pretty busy, but when Simple Girl said she was looking for some summer picks I thought that was just what I needed to kick-start myself. So, I volunteered to host in August and picked one of my summer favorites – Rhubarb Cupcakes with Whipped Cream! I actually tried these for the first time last summer and I must admit I don’t know that before trying these that I had ever eaten rhubarb. IÂ decidedÂ to make these again this summer since they were such a hit last year. Like I did last year, I used some fresh rhubarb from my advisor’s garden. Since I’m the host this month I can post the recipe (which is at the bottom of this post), but if you like this recipe or any others you see on the MSC blogÂ I would really encourage you to buy the book. 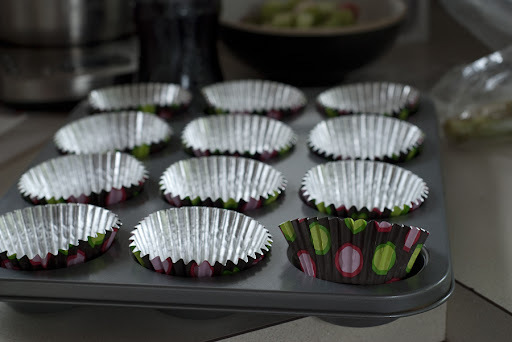 You can get it on Amazon right hereÂ Â for less than $15.Â The recipe calls for taking off the cupcake liners before serving, but Â I finally found the Reynolds StayBrite cupcake linersÂ and I really likedÂ this pattern so I decided to keep the liners on. I was definitely impressed by these liners. Â I was looking for them for a while and finally ran into them at Kroger. They definitely stayed bright! I am guessing that foil inside helped. 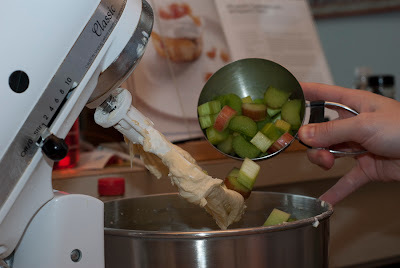 Â Here are a few action shots Josh got – meÂ dumping the rhubarb into theÂ batter and filling the liners. Â Doesn’t that rhubarb look so good? I love how chunky the batter is. You can tell when you are Â filling the cups that each bite is going to be full of tasty rhubarb. I love it! I popped these into the oven and then began working on the rhubarb topping. Another good thing about my trip to Kroger was that I found vanilla beans! The last time I searched everywhere! I was about to give up, but I finally found them at a health food store, but they were not cheap! Needless to say I was very happy to find a more inexpensive Kroger brand. I really do think using the vanilla bean adds a lot to the rhubarb topping (at least to its appearance anyway). I just Â love how you can see the little specks of vanilla! 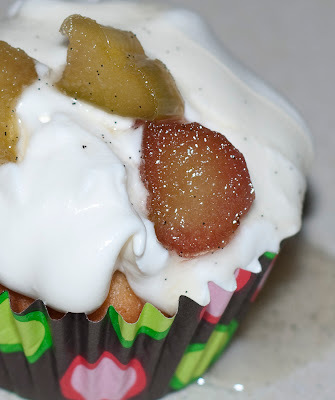 I was planning to bring these to a meeting I had early the next day so since the recipe said you could store the topping in an airtight container, I decided to make the cupcakes and topping the night before and wake up early to make the whipped cream. The topping did get a little hard in the fridge, but a little stirring helped that. I also probably didn’t wait for it to get to room temperature completely like the recipe indicates. In the morning I made the whipped cream and assembled my cupcakes. I ended up doubling the batch because I was bringing these to a meeting with about 20 people or so. So, I packed up my trusty Martha Stewart cupcake carrier (minus a few cupcakes that I left home for Josh and I). 1. Preheat oven to 350Â degrees. Line standard muffin tins with paper liners. Whisk together flour, baking soda, baking powder, and salt. 2. With an electric mixer on medium-high speed, cream butter and 1 cup sugar until pale and fluffy. Add eggs, one at a time, beating until each is incorporated, scraping down sides of bowl as needed. Beat in vanilla extract. Reduce speed to low. Add flour mixture in two batches, alternating with the sour cream, and beating until combined after each. Stir in 2 cups diced rhubarb. 3. Divide batter evenly among lined cups, filling each three- quarters full. Bake, rotating tins halfway through, until a cake tester inserted in centers comes out clean, about 25 minutes. Transfer tins to wire racks to cool completely before removing cupcakes. 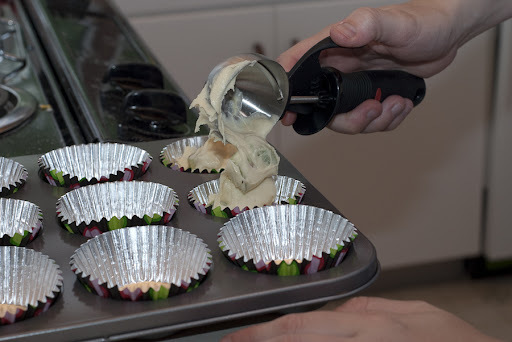 Cupcakes can be stored up to 3 days at room temperature in airtight containers; remove liners before topping if desired. 4. To make rhubarb topping, use the tip of a paring knife to scrape vanilla-bean seeds into a saucepan, reserving pod for another use (such as vanilla sugar). Add the water and remaining 1 cup sugar, and bring to a simmer, stirring to dissolve sugar. 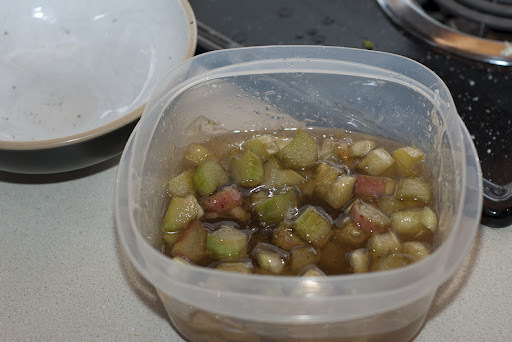 Remove from heat, and stir in remaining 1 cup rhubarb. Let cool completely. Remove rhubarb with a slotted spoon, and reserve. Return liquid to a simmer, and cook until reduced by half, 5 to 8 minutes. Let cool slightly, then return rhubarb to syrup. Once cool, rhubarb can be refrigerated in syrup up to 1 week in an airtight container; bring to room temperature before using. 5. 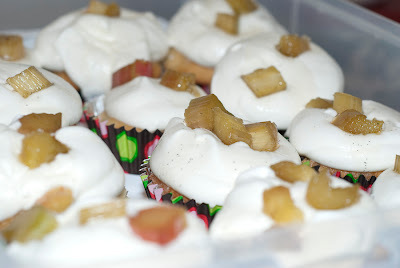 To finish, dollop a generous amount of whipped cream onto each cupcake, and top with rhubarb and some syrup. Serve immediately. 1. Whisk heavy cream until soft peaks form. Loved these! Thanks for choosing such a great recipe. Hi Lorraine! Thanks so much for hosting! I agree that these were super delicious. The topping totally made the cupcake. Thanks so much for a terrific pick! P.S. Love those Stay Brite Liners! I’ll definitely have to pick some up! 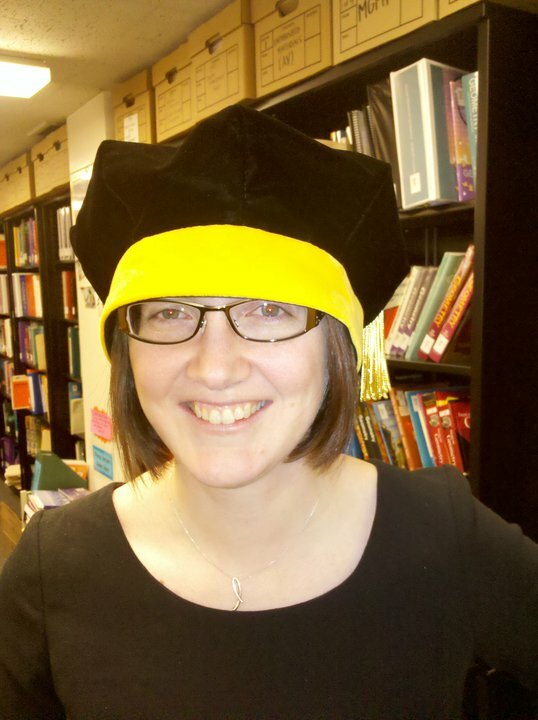 Julie – Thanks for baking along! Rachel – I totally agree with you – the topping totally makes the cupcake – especially with that vanilla bean! I loved the StayBrite wrappers and the black and white one they have would go perfect with the Michael’s boxes you posted about! I’m sorry I didn’t bake along with you and it sure looks like a fantastic recipe that I should have made time for! Rebecca – Thanks for commenting. Don’t worry about not baking along… after picking it I started wondering if people have access to good rhubarb. I guess in some places it just isn’t available. If you get a chance to make it at some point – take it because they are really good!